The fall issue of Aperture magazine delves into the relationship between sound and image. How have photographers drawn inspiration from music? How have cultures of image making developed in tandem with music making? Whether capturing an intoxicating performance, or individuals lost in dance or caught in an ecstatic moment of listening, photographs give form to the ways sounds move us. This issue’s features include John Jeremiah Sullivan‘s profile of William Eggleston and his long-standing passion for music; a conversation with Vancouver-based photo-conceptualist Stan Douglas; a remembrance of the legendary Malian photographer Malick Sidibé; Vinca Petersen‘s look at underground rave culture in the 1990s; Vince Aletti on LP art; and much more. Use #ApertureSounds to join the conversation on Twitter, Instagram, and Facebook. 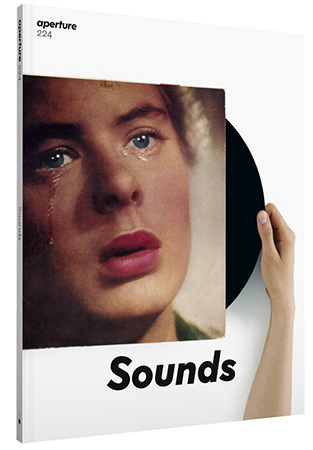 Subscribe now to receive “Sounds” and more great issues.